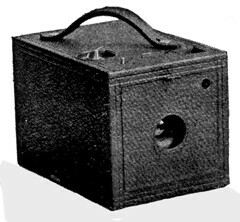 The Boston Camera Manufacturing Company was founded by Samuel N. Turner. He applied for a patent on rolls of paper-backed film in 1892 and received it in 1895. He developed the Bulls Eye box cameras with integrated rollfilm holder and red bulls eye as means of exposure counting. The cameras were even sold in Europe through the London office of Blair, another Boston camera maker. Both camera makers were bought by Kodak in the 1890s. This page was last edited on 17 July 2013, at 20:02.